How to get the most out of our online strain catalogue resource. Welcome to our new website! To get you started we’re featuring a few blog posts that point out some of the features we built into the site to help improve your Dark Heart Nursery experience. In this strain catalogue tutorial we are going to explore our strain catalogue. Some of you may be familiar with the “strain binders” we make available to our retail partners which contains cultivation and other information about the varieties we offer. This information is now replicated in our online catalogue, and since it’s online the data is more interactive and up-to-date than ever. With the new web functionality, you will now be able to find strain information quickly and easily, review strains, and share your garden photos. Let’s take a closer look! One cool feature about our online strain catalogue is the sort functionality. Now you will be able to filter through DHN varieties by type, yield, flowering times and more. Search filter boxes are located on right hand side of the strains list. You may select one or more options in one or more boxes. Once your preferences are selected, hit the “filter strains” button, and voila! This function will allow you to narrow down varieties based on your personal preferences. Choosing a variety to grow is now a simple task. Have you grown our clones? We hope you’ll share your experience! Now you can write a customer review and tell us about your experience, grow tips and techniques, or any other feedback you’d like for others to know. 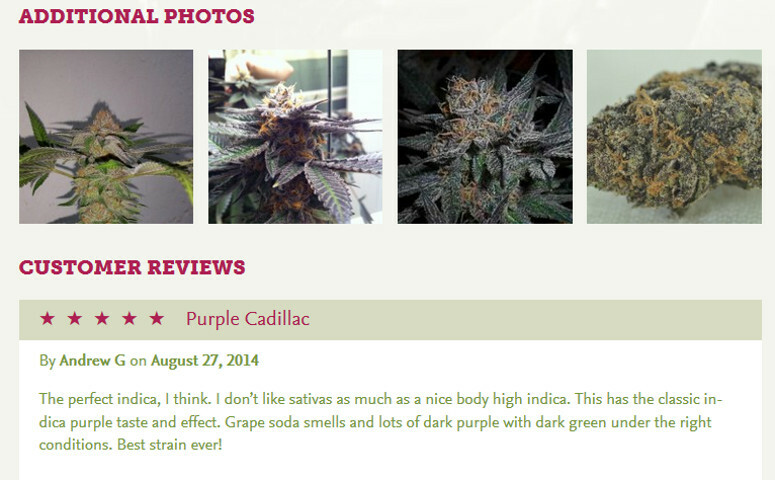 From the Strains Catalogue page, select the variety you wish to provide a review for. Once inside the variety page, scroll down and click on “Write a Customer Review” which is located on the bottom right hand side of the page. Also located here is the link to upload photos. To upload any photos you wish to showcase, click “Send us your photos”. You will be directed to an upload form. Any information you share is kept strictly confidential; if your photos are suitable for use, they will be featured in the “Additional Photos” section of each strain page.